The race: Here's the report from stage winner Sam Bennett's Bora-hansgrohe team. A fast start and fight for the breakaway on the final stage marked the 164km flat stage. It took more than 50km for a breakaway to form as eight riders went up the road. The BORA -hansgrohe guys stayed in the peloton and worked for their sprinter Sam Bennett. With 6km to go the pack caught the breakaway and with a predicted bunch sprint on the cards, the sprinter’s teams started to form their lead-out. Approaching the flamme rouge, the multiple Giro d’Italia stage winner Sam Bennett launched a surprise attack and quickly established a large gap. This incredible attack put the peloton on the back foot, scrambling to bring Bennett back inside the final kilometer. 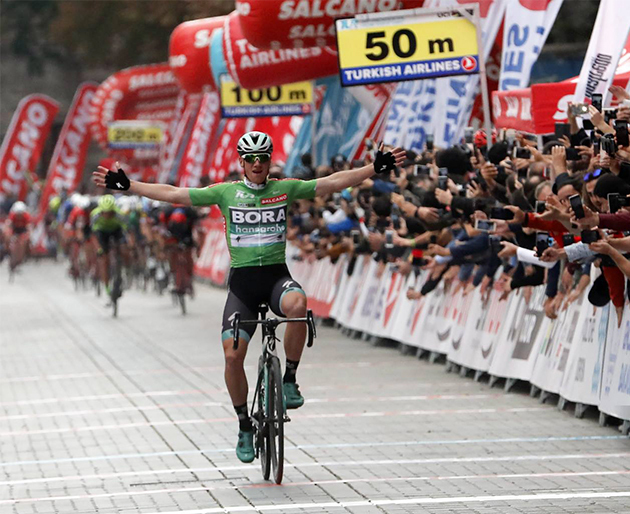 Sam Bennett held on to take another impressive win in the chaotic finale on the last day at the Tour of Turkey. With this amazing victory Sam Bennett won also the sprint jersey of the 54th Presidential Tour of Turkey. The Tour of Turkey was the last race for Matteo Pelucchi and Alex Saramontis in the BORA - hansgrohe jerseys. We want to say thank you and wish them all the best for their future. 3 DRUCKER Jempy BMC s.t. 4 TEUNISSEN Mike Team Sunweb s.t. 5 SAJNOK Szymon CCC Sprandi Polkowice s.t. 6 SERRANO Gonzalo Caja Rural-Seguros RGA s.t. 7 BOHLI Tom BMC s.t. 8 ULISSI Diego UAE-Team Emirates s.t. 9 GUERREIRO Ruben Trek-Segafredo s.t. 10 ŠTYBAR Zdeněk Quick-Step Floors s.t. 11 HAAS Nathan Katusha-Alpecin s.t. 12 NOPPE Christophe Sport Vlaanderen-Baloise s.t. 13 LUTSENKO Alexey Astana s.t. 14 FERNÁNDEZ Delio Delko-Marseille Provence s.t. 15 HAUSSLER Heinrich Bahrain-Merida s.t. 16 THEUNS Edward Team Sunweb s.t. 17 FABBRO Matteo Katusha-Alpecin s.t. 18 JONES Brenton Delko-Marseille Provence s.t. 19 PORSEV Alexander Gazprom-RusVelo s.t. 20 ROCHE Nicolas BMC s.t. 21 FELLINE Fabio Trek-Segafredo s.t. 22 FINETTO Mauro Delko-Marseille Provence s.t. 23 PACIONI Luca Wilier Triestina-Selle Italia s.t. 24 MORTIER Julien WB-Aqua Protect-Veranclassic s.t. 25 TRARIEUX Julien Delko-Marseille Provence s.t. 26 PÖSTLBERGER Lukas Bora-hansgrohe s.t. 27 DELTOMBE Kevin Sport Vlaanderen-Baloise s.t. 28 REYES Aldemar Manzana Postobon s.t. 29 SPRENGERS Thomas Sport Vlaanderen-Baloise s.t. 30 VAN ROOY Kenneth Sport Vlaanderen-Baloise s.t. 31 ROVNY Ivan Gazprom-RusVelo s.t. 32 HODEG Álvaro Quick-Step Floors s.t. 33 AGUIRRE Hernán Manzana Postobon s.t. 34 PEYSKENS Dimitri WB-Aqua Protect-Veranclassic s.t. 35 DEGENKOLB John Trek-Segafredo s.t. 36 FERRARI Fabricio Caja Rural-Seguros RGA s.t. 37 BOOKWALTER Brent BMC s.t. 38 HOLLENSTEIN Reto Katusha-Alpecin s.t. 39 ORJUELA Fernando Manzana Postobon s.t. 40 FRANKINY Kilian BMC s.t. 41 MENDES José Burgos-BH s.t. 42 ÖRKEN Ahmet Turkish National Team s.t. 43 BOL Jetse Burgos-BH s.t. 44 RUBIO Diego Burgos-BH s.t. 45 LIETAER Eliot WB-Aqua Protect-Veranclassic s.t. 46 MCCARTHY Jay Bora-hansgrohe s.t. 47 FRÖHLINGER Johannes Team Sunweb s.t. 48 KNOX James Quick-Step Floors s.t. 49 ANTUNES Amaro CCC Sprandi Polkowice s.t. 50 REIS Rafael Caja Rural-Seguros RGA s.t. 51 MASSON Christophe WB-Aqua Protect-Veranclassic s.t. 52 DUARTE Fabio Manzana Postobon s.t. 53 NAVARDAUSKAS Ramūnas Bahrain-Merida s.t. 54 VAN GOMPEL Mathias Sport Vlaanderen-Baloise s.t. 55 DECLERCQ Tim Quick-Step Floors s.t. 56 CABEDO Óscar Burgos-BH s.t. 57 BROŻYNA Piotr CCC Sprandi Polkowice s.t. 58 SIERRA Yecid Manzana Postobon s.t. 59 MITRI James Burgos-BH s.t. 60 PARDILLA Sergio Caja Rural-Seguros RGA s.t. 61 BAKIRCI Nazim Turkish National Team s.t. 62 CONTI Valerio UAE-Team Emirates s.t. 63 VILELA Ricardo Manzana Postobon s.t. 64 SAYAR Mustafa Turkish National Team s.t. 65 KURIANOV Stepan Gazprom-RusVelo s.t. 66 TRUSOV Nikolay Gazprom-RusVelo s.t. 68 SHILOV Sergey Gazprom-RusVelo s.t. 69 IRISARRI Jon Caja Rural-Seguros RGA s.t. 71 SESSLER Nícolas Burgos-BH s.t. 72 BEVIN Patrick BMC s.t. 73 FOMINYKH Daniil Astana s.t. 75 CUBERO Jorge Burgos-BH s.t. 77 BELKOV Maxim Katusha-Alpecin s.t. 78 ROSA Massimo Wilier Triestina-Selle Italia s.t. 79 GRADEK Kamil CCC Sprandi Polkowice s.t. 84 TLEUBAYEV Ruslan Astana s.t. 85 ZABALA Josu Caja Rural-Seguros RGA s.t. 86 RICHEZE Maximiliano Quick-Step Floors s.t. 87 DE KORT Koen Trek-Segafredo s.t. 88 REIJNEN Kiel Trek-Segafredo s.t. 89 BERNAS Paweł CCC Sprandi Polkowice s.t. 91 PELUCCHI Matteo Bora-hansgrohe s.t. 92 PER David Bahrain-Merida s.t. 95 KEISSE Iljo Quick-Step Floors s.t. 96 BEVILACQUA Simone Wilier Triestina-Selle Italia s.t. 97 BALKAN Onur Turkish National Team s.t. 99 BARCELÓ Fernando Euskadi-Murias s.t. 100 SARAMOTINS Aleksejs Bora-hansgrohe s.t. 101 ARISTI Mikel Euskadi-Murias s.t. 102 AKDILEK Ahmet Turkish National Team s.t. 103 BARRENETXEA Ander Euskadi-Murias s.t. 104 VAN POPPEL Boy Trek-Segafredo s.t. 105 DE GENDT Aimé Sport Vlaanderen-Baloise s.t. 106 MORENO Javier Delko-Marseille Provence s.t. 107 BERTAZZO Liam Wilier Triestina-Selle Italia s.t. 109 BODNAR Maciej Bora-hansgrohe s.t. 110 PALUTA Michał CCC Sprandi Polkowice s.t. 111 SAGAN Juraj Bora-hansgrohe s.t. 112 LAENGEN Vegard UAE-Team Emirates s.t. 113 BYSTROM Sven UAE-Team Emirates s.t. 114 NOVAK Domen Bahrain-Merida s.t. 115 GRMAY Tsgabu Trek-Segafredo s.t. 116 SILVA Joaquim Caja Rural-Seguros RGA s.t. 117 TXOPERENA Beñat Euskadi-Murias s.t. 118 BIZHIGITOV Zhandos Astana s.t. 119 WYSS Danilo BMC s.t. 120 MOSER Moreno Astana s.t. 121 SAMLI Ferit Turkish National Team s.t. 122 KIRSCH Alex WB-Aqua Protect-Veranclassic s.t. 123 STASSEN Julien WB-Aqua Protect-Veranclassic s.t. 124 TEN DAM Laurens Team Sunweb s.t. 126 WÜRTZ Mads Katusha-Alpecin s.t. 129 BOLE Grega Bahrain-Merida s.t. 132 MIHAYLOV Nikolay Delko-Marseille Provence s.t. 133 RODRÍGUEZ Sergio Euskadi-Murias s.t. 2 LUTSENKO Alexey Astana s.t. 4 ULISSI Diego UAE-Team Emirates s.t. 7 FERNÁNDEZ Delio Delko-Marseille Provence s.t. 8 FABBRO Matteo Katusha-Alpecin s.t. 9 FINETTO Mauro Delko-Marseille Provence s.t. 10 ROCHE Nicolas BMC s.t. 11 FRANKINY Kilian BMC s.t. 12 BOOKWALTER Brent BMC s.t. 14 AGUIRRE Hernán Manzana Postobon s.t. 18 ROVNY Ivan Gazprom-RusVelo s.t. 23 PÖSTLBERGER Lukas Bora-hansgrohe s.t. 24 PARDILLA Sergio Caja Rural-Seguros RGA s.t. 28 VAN GOMPEL Mathias Sport Vlaanderen-Baloise s.t. 36 FOMINYKH Daniil Astana s.t. 39 HAUSSLER Heinrich Bahrain-Merida s.t. 48 PADUN Mark Bahrain-Merida s.t. 61 FRÖHLINGER Johannes Team Sunweb s.t. 82 JONES Brenton Delko-Marseille Provence s.t. 106 CONTI Valerio UAE-Team Emirates s.t. The race: Here's the report from stage winner Alvaro Hodeg's Quick-Step team. Perfection rarely exists, but when it does, it can take various incarnations. 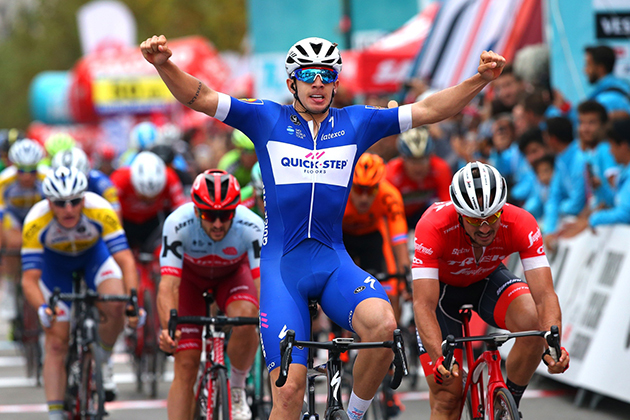 On Saturday, it came under the form of the Quick-Step Floors lead-out train, which bossed the Tour of Turkey stage 5 finale and propelled 22-year-old Alvaro Hodeg to a beautiful victory on the streets of Manisa, a city making its first appearance this century at the race. Quick-Step Floors were in absolute control of the stage from start to finish, with Tim Declercq marshaling the front of the bunch for the better part of the 135.7km stage and relentlessly chasing the five escapees who got reeled in inside the final ten kilometers following an injection of pace from James Knox, the team's best performer on the queen stage, who took over the reins for the closing kilometers, pushing a huge tempo that made it hard for the others to overtake the tremendous train which included also Iljo Keisse, Zdenek Stybar and Max Richeze. After Keisse and Stybar kept Quick-Step Floors in the driving seat as they passed under the red kite, Richeze proved again why he is one of the best lead-out men of our times, maintaining a high speed before peeling off the front only with 100 meters to go and leaving Alvaro Hodeg in an ideal position, from which the young Colombian couldn't miss, comfortably beating John Degenkolb (Trek-Segafredo) and Nathan Haas (Katusha-Alpecin) for his third World Tour victory of the year. "I am proud of how the team controlled the race today, especially the last kilometers, which were perfect. They were all amazing and I want to thank the guys, because without them it wouldn't have been possible to pull it off and get my fifth success in the Quick-Step Floors jersey", an emotional Alvaro said after netting the team's 71st win of the season, an astounding number which serves to underline out outfit's utter dominance in 2018. "We knew the final it was a bit uphill and with some headwind, so I followed the instructions of Max, who placed me perfectly to open the sprint in the last 100 meters. Every victory is special, but this is really something, because it came in my last race of the year and I am happy I could repay the squad for the trust they put in me. The Tour of Turkey ends tomorrow and we hope we will finish it in style", said Alvaro of the stage that will take the peloton to Istanbul. 2 DEGENKOLB John Trek-Segafredo s.t. 3 HAAS Nathan Katusha-Alpecin s.t. 4 BENNETT Sam Bora-hansgrohe s.t. 5 NOPPE Christophe Sport Vlaanderen-Baloise s.t. 6 THEUNS Edward Team Sunweb s.t. 7 SAJNOK Szymon CCC Sprandi Polkowice s.t. 8 RICHEZE Maximiliano Quick-Step Floors s.t. 9 PORSEV Alexander Gazprom-RusVelo s.t. 10 CONSONNI Simone UAE-Team Emirates s.t. 11 VAN ROOY Kenneth Sport Vlaanderen-Baloise s.t. 12 HAUSSLER Heinrich Bahrain-Merida s.t. 13 GUERREIRO Ruben Trek-Segafredo s.t. 14 SERRANO Gonzalo Caja Rural-Seguros RGA s.t. 15 JULES Justin WB-Aqua Protect-Veranclassic s.t. 16 FABBRO Matteo Katusha-Alpecin s.t. 17 DELTOMBE Kevin Sport Vlaanderen-Baloise s.t. 18 DRUCKER Jempy BMC s.t. 19 GARCÍA Jhojan Manzana Postobon s.t. 20 JONES Brenton Delko-Marseille Provence s.t. 21 IRISARRI Jon Caja Rural-Seguros RGA s.t. 22 MASSON Christophe WB-Aqua Protect-Veranclassic s.t. 23 ARISTI Mikel Euskadi-Murias s.t. 24 FERRARI Fabricio Caja Rural-Seguros RGA s.t. 25 PRADES Eduard Euskadi-Murias s.t. 26 PEYSKENS Dimitri WB-Aqua Protect-Veranclassic s.t. 27 LIETAER Eliot WB-Aqua Protect-Veranclassic s.t. 28 PACIONI Luca Wilier Triestina-Selle Italia s.t. 29 HOLLENSTEIN Reto Katusha-Alpecin s.t. 30 ROCHE Nicolas BMC s.t. 31 ÖRKEN Ahmet Turkish National Team s.t. 32 ULISSI Diego UAE-Team Emirates s.t. 33 FERNÁNDEZ Delio Delko-Marseille Provence s.t. 34 TRUSOV Nikolay Gazprom-RusVelo s.t. 36 FELLINE Fabio Trek-Segafredo s.t. 37 TRARIEUX Julien Delko-Marseille Provence s.t. 38 ORJUELA Fernando Manzana Postobon s.t. 39 TEUNISSEN Mike Team Sunweb s.t. 40 FINETTO Mauro Delko-Marseille Provence s.t. 41 SAYAR Mustafa Turkish National Team s.t. 42 KASPERKIEWICZ Przemysław Delko-Marseille Provence s.t. 43 BROŻYNA Piotr CCC Sprandi Polkowice s.t. 44 BOHLI Tom BMC s.t. 45 LUTSENKO Alexey Astana s.t. 46 ROVNY Ivan Gazprom-RusVelo s.t. 48 KIRSCH Alex WB-Aqua Protect-Veranclassic s.t. 49 NAVARDAUSKAS Ramūnas Bahrain-Merida s.t. 50 BOL Jetse Burgos-BH s.t. 51 RUBIO Diego Burgos-BH s.t. 52 BEVIN Patrick BMC s.t. 53 FRANKINY Kilian BMC s.t. 54 PADUN Mark Bahrain-Merida s.t. 55 AGUIRRE Hernán Manzana Postobon s.t. 56 SHILOV Sergey Gazprom-RusVelo s.t. 57 SESSLER Nícolas Burgos-BH s.t. 58 ZABALA Josu Caja Rural-Seguros RGA s.t. 59 MENDES José Burgos-BH s.t. 60 SARAMOTINS Aleksejs Bora-hansgrohe s.t. 61 MCCARTHY Jay Bora-hansgrohe s.t. 62 KNOX James Quick-Step Floors s.t. 63 ARNDT Nikias Team Sunweb s.t. 64 ROSA Massimo Wilier Triestina-Selle Italia s.t. 65 ZHUPA Eugert Wilier Triestina-Selle Italia s.t. 66 CIEŚLIK Paweł CCC Sprandi Polkowice s.t. 67 COLEDAN Marco Wilier Triestina-Selle Italia s.t. 68 DECLERCQ Tim Quick-Step Floors s.t. 69 MITRI James Burgos-BH s.t. 70 GRMAY Tsgabu Trek-Segafredo s.t. 71 PÖSTLBERGER Lukas Bora-hansgrohe s.t. 72 BOOKWALTER Brent BMC s.t. 73 MORTIER Julien WB-Aqua Protect-Veranclassic s.t. 74 PARDILLA Sergio Caja Rural-Seguros RGA s.t. 75 VAN GOMPEL Mathias Sport Vlaanderen-Baloise s.t. 76 SAGAN Juraj Bora-hansgrohe s.t. 77 CRAS Steff Katusha-Alpecin s.t. 78 LAENGEN Vegard UAE-Team Emirates s.t. 79 BELKOV Maxim Katusha-Alpecin s.t. 80 MORENO Javier Delko-Marseille Provence s.t. 81 CABEDO Óscar Burgos-BH s.t. 82 PER David Bahrain-Merida s.t. 83 DUARTE Fabio Manzana Postobon s.t. 84 CONTI Valerio UAE-Team Emirates s.t. 85 ĐURASEK Kristijan UAE-Team Emirates s.t. 86 FOMINYKH Daniil Astana s.t. 87 KOZONTCHUK Dmitry Gazprom-RusVelo s.t. 88 NIEMIEC Przemysław UAE-Team Emirates s.t. 89 BIZHIGITOV Zhandos Astana s.t. 90 TEN DAM Laurens Team Sunweb s.t. 91 DE KORT Koen Trek-Segafredo s.t. 92 POZZATO Filippo Wilier Triestina-Selle Italia s.t. 93 VILELA Ricardo Manzana Postobon s.t. 94 SIERRA Yecid Manzana Postobon s.t. 95 WYSS Danilo BMC s.t. 96 GIDICH Yevgeniy Astana s.t. 97 TXOPERENA Beñat Euskadi-Murias s.t. 98 REIS Rafael Caja Rural-Seguros RGA s.t. 99 BAKIRCI Nazim Turkish National Team s.t. 100 BEVILACQUA Simone Wilier Triestina-Selle Italia s.t. 101 REYES Aldemar Manzana Postobon s.t. 102 VERVAEKE Louis Team Sunweb s.t. 103 VAN HECKE Preben Sport Vlaanderen-Baloise s.t. 104 KURIANOV Stepan Gazprom-RusVelo s.t. 105 SILVA Joaquim Caja Rural-Seguros RGA s.t. 106 NOVAK Domen Bahrain-Merida s.t. 107 BYSTROM Sven UAE-Team Emirates s.t. 108 TLEUBAYEV Ruslan Astana s.t. 109 CUBERO Jorge Burgos-BH s.t. 110 ATALAY Muhammed Turkish National Team s.t. 111 ŠTYBAR Zdeněk Quick-Step Floors s.t. 112 ANTUNES Amaro CCC Sprandi Polkowice s.t. 113 MIHAYLOV Nikolay Delko-Marseille Provence s.t. 114 BARCELÓ Fernando Euskadi-Murias s.t. 115 PALUTA Michał CCC Sprandi Polkowice s.t. 116 BARRENETXEA Ander Euskadi-Murias s.t. 117 BOEV Igor Gazprom-RusVelo s.t. 118 KEISSE Iljo Quick-Step Floors s.t. 119 AKDILEK Ahmet Turkish National Team s.t. 120 STASSEN Julien WB-Aqua Protect-Veranclassic s.t. 122 REIJNEN Kiel Trek-Segafredo s.t. 123 BODNAR Maciej Bora-hansgrohe s.t. 124 BALKAN Onur Turkish National Team s.t. 126 DE GENDT Aimé Sport Vlaanderen-Baloise s.t. 127 VAN POPPEL Boy Trek-Segafredo s.t. 132 RODRÍGUEZ Sergio Euskadi-Murias s.t. 3 ULISSI Diego UAE-Team Emirates s.t. 24 PADUN Mark Bahrain-Merida s.t. 25 PARDILLA Sergio Caja Rural-Seguros RGA s.t. 33 VAN GOMPEL Mathias Sport Vlaanderen-Baloise s.t. 34 FOMINYKH Daniil Astana s.t. 43 HAUSSLER Heinrich Bahrain-Merida s.t. 44 CIEŚLIK Paweł CCC Sprandi Polkowice s.t. 64 FRÖHLINGER Johannes Team Sunweb s.t. 87 JONES Brenton Delko-Marseille Provence s.t. 98 SAJNOK Szymon CCC Sprandi Polkowice s.t. 112 CONTI Valerio UAE-Team Emirates s.t. 126 STASSEN Julien WB-Aqua Protect-Veranclassic s.t. The race: Winner Alexey Lutsenko's Astana team posted these remarks. Kazakh National Champion Alexey Lutsenko celebrated a beautiful victory at the queen stage of Presidential Tour of Turkey taken in mountain sprint on the top of the final climb after 206,9 km of racing. With this powerful victory Alexey Lutsenko also becomes the new leader of the general classification of the race. - It was a really hard and long stage. I had good legs and at the top of the final climb I sprinted for a victory. I’m happy with this victory and for taking the leader jersey at my last race in this season. It is important for my team and me. I want to thank all my teammates for a good job for me during the whole day. We have two more important days here in Turkey and we will do out best to keep the leader jersey until the final podium in Istanbul, - commented Alexey Lutsenko. Before two more flat, but nervous stages to go Alexey Lutsenko has 4 seconds advantage on Diego Ulissi, who is second overall, and 6 seconds on Eduard Prades, who completed the GC podium. 2 Diego Ulissi UAE-Team Emirates s.t. 3 Eduard Prades Euskadi-Murias s.t. 4 James Knox Quick-Step Floors s.t. 5 Nicolas Roche BMC s.t. 6 Ruben Guerreiro Trek-Segafredo s.t. 7 Mauro Finetto Delko-Marseille Provence s.t. 8 Delio Fernández Delko-Marseille Provence s.t. 9 Matteo Fabbro Katusha-Alpecin s.t. 10 Kilian Frankiny BMC s.t. 11 Brent Bookwalter BMC s.t. 12 Fabio Felline Trek-Segafredo s.t. 13 Nathan Haas Katusha-Alpecin s.t. 15 Mike Teunissen Team Sunweb s.t. 17 Kevin Deltombe Sport Vlaanderen-Baloise s.t. 18 Ivan Rovnyi Gazprom-RusVelo s.t. 19 Fernando Orjuela Manzana Postobon s.t. 23 Dimitri Peyskens WB-Aqua Protect-Veranclassic s.t. 24 Mark Padun Bahrain-Merida s.t. 25 Sergio Pardilla Caja Rural-Seguros RGA s.t. 32 Fabio Duarte Manzana Postobon s.t. 34 Mathias Van Gompel Sport Vlaanderen-Baloise s.t. 35 Daniil Fominykh Astana s.t. 38 Josu Zabala Caja Rural-Seguros RGA s.t. 44 Pawel Cieslik CCC Sprandi Polkowice s.t. 45 Amaro Antunes CCC Sprandi Polkowice s.t. 46 Heinrich Haussler Bahrain-Merida s.t. 57 Laurens ten Dam Team Sunweb s.t. 59 Kiel Reijnen Trek-Segafredo s.t. 60 Zhandos Bizhigitov Astana s.t. 61 Justin Jules WB-Aqua Protect-Veranclassic s.t. 63 Koen de Kort Trek-Segafredo s.t. 64 Johannes Fröhlinger Team Sunweb s.t. 66 Dmitry Kozonchuk Gazprom-RusVelo s.t. 71 Joaquim Silva Caja Rural-Seguros RGA s.t. 72 Vegard Laengen UAE-Team Emirates s.t. 76 Enrique Sanz Euskadi-Murias s.t. 77 Danilo Wyss BMC s.t. 79 Nicolas Sessler Burgos-BH s.t. 80 Kenneth Van Rooy Sport Vlaanderen-Baloise s.t. 81 Alex Kirsch WB-Aqua Protect-Veranclassic s.t. 82 Beñat Txoperena Euskadi-Murias s.t. 83 Massimo Rosa Wilier Triestina-Selle Italia s.t. 84 Álvaro Hodeg Quick-Step Floors s.t. 85 Simone Consonni UAE-Team Emirates s.t. 86 Christophe Noppe Sport Vlaanderen-Baloise s.t. 87 Igor Boev Gazprom-RusVelo s.t. 88 Mikel Aristi Euskadi-Murias s.t. 89 Michal Paluta CCC Sprandi Polkowice s.t. 90 Maxim Belkov Katusha-Alpecin s.t. 91 Juraj Sagan Bora-hansgrohe s.t. 92 Jay McCarthy Bora-hansgrohe s.t. 95 Tom Bohli BMC s.t. 96 Mads Würtz Katusha-Alpecin s.t. 97 Artyom Zakharov Astana s.t. 98 Matteo Pelucchi Bora-hansgrohe s.t. 99 Brenton Jones Delko-Marseille Provence s.t. 100 Alexander Porsev Gazprom-RusVelo s.t. 101 John Degenkolb Trek-Segafredo s.t. 102 Moreno Moser Astana s.t. 107 Ahmet Akdilek Turkish National Team s.t. 110 Filippo Pozzato Wilier Triestina-Selle Italia s.t. 111 Eugert Zhupa Wilier Triestina-Selle Italia s.t. 112 Szymon Sajnok CCC Sprandi Polkowice s.t. 113 Luca Pacioni Wilier Triestina-Selle Italia s.t. 114 Sergio Rodríguez Euskadi-Murias s.t. 115 Julien Stassen WB-Aqua Protect-Veranclassic s.t. 118 Przemyslaw Kasperkiewicz Delko-Marseille Provence s.t. 119 Jon Irisarri Caja Rural-Seguros RGA s.t. 120 Feritcan Samli Turkish National Team s.t. 122 Liam Bertazzo Wilier Triestina-Selle Italia s.t. 123 Ander Barrenetxea Euskadi-Murias s.t. 124 Muhammet Atalay Turkish National Team s.t. 126 Maciej Bodnar Bora-hansgrohe s.t. 127 Diego Rubio Burgos-BH s.t. 128 Grega Bole Bahrain-Merida s.t. 134 Valerio Conti UAE-Team Emirates s.t. 5 Ruben Guerreiro Trek-Segafredo s.t. 6 Delio Fernández Delko-Marseille Provence s.t. 7 Fabio Felline Trek-Segafredo s.t. 8 Mauro Finetto Delko-Marseille Provence s.t. 10 Nicolas Roche BMC s.t. 11 Kilian Frankiny BMC s.t. 12 Brent Bookwalter BMC s.t. 14 Hernán Aguirre Manzana Postobon s.t. 23 Lukas Pöstlberger Bora-hansgrohe s.t. 24 Sergio Pardilla Caja Rural-Seguros RGA s.t. 25 Mark Padun Bahrain-Merida s.t. 33 Mathias Van Gompel Sport Vlaanderen-Baloise s.t. 34 Daniil Fominykh Astana s.t. 43 Pawel Cieslik CCC Sprandi Polkowice s.t. 44 Heinrich Haussler Bahrain-Merida s.t. 98 Szymon Sajnok CCC Sprandi Polkowice s.t. 102 Maciej Bodnar Bora-hansgrohe s.t. 112 Valerio Conti UAE-Team Emirates s.t. 127 Julien Stassen WB-Aqua Protect-Veranclassic s.t. Sam Bennett makes it two in a row. Bettini photo. The race: Here's the report from winner Sam Bennett's Bora-hansgrohe team. Stage three at the Tour of Turkey was another finish for the sprinters. Today’s 137km fast stage went from Fethiye to Marmaris and was a great chance for Sam Bennett to defend his leader jersey and he did so in fine fashion. Like yesterday, the BORA – hansgrohe train perfectly delivered the chance for Bennett by controlling the whole day at the front of the peloton. In the tricky and fast finale, which Bennett knew from last year, where he took the win, the Irish sprinter navigated his way to begin his long winning sprint and in doing so extends his lead at the Tour of Turkey ahead of M. Richeze. 2 RICHEZE Maximiliano Quick-Step Floors s.t. 3 DEGENKOLB John Trek-Segafredo s.t. 4 BEVIN Patrick BMC s.t. 5 ORKEN Ahmet Turkish National Team s.t. 6 GARCÍA Iván Bahrain-Merida s.t. 7 LUTSENKO Alexey Astana s.t. 8 HAAS Nathan Katusha-Alpecin s.t. 9 KASPERKIEWICZ Przemysław Delko-Marseille Provence s.t. 10 ARISTI Mikel Euskadi-Murias s.t. 12 LIETAER Eliot WB-Aqua Protect-Veranclassic s.t. 13 SERRANO Gonzalo Caja Rural-Seguros RGA s.t. 14 TRARIEUX Julien Delko-Marseille Provence s.t. 15 PRADES Eduard Euskadi-Murias s.t. 16 PALUTA Michał CCC Sprandi Polkowice s.t. 17 ANTUNES Amaro CCC Sprandi Polkowice s.t. 18 PEYSKENS Dimitri WB-Aqua Protect-Veranclassic s.t. 19 GUERREIRO Ruben Trek-Segafredo s.t. 20 ULISSI Diego UAE-Team Emirates s.t. 21 DELTOMBE Kevin Sport Vlaanderen-Baloise s.t. 22 REIS Rafael Caja Rural-Seguros RGA s.t. 23 TRUSOV Nikolay Gazprom-RusVelo s.t. 24 VERVAEKE Louis Team Sunweb s.t. 25 BALKAN Onur Turkish National Team s.t. 26 SPRENGERS Thomas Sport Vlaanderen-Baloise s.t. 27 HOLLENSTEIN Reto Katusha-Alpecin s.t. 28 FELLINE Fabio Trek-Segafredo s.t. 29 GARCÍA Jhojan Manzana Postobon s.t. 30 IRISARRI Jon Caja Rural-Seguros RGA s.t. 31 ĐURASEK Kristijan UAE-Team Emirates s.t. 32 AGUIRRE Hernán Manzana Postobon s.t. 34 DRUCKER Jempy BMC s.t. 35 TEUNISSEN Mike Team Sunweb s.t. 36 VILELA Ricardo Manzana Postobon s.t. 37 CRAS Steff Katusha-Alpecin s.t. 38 SHILOV Sergey Gazprom-RusVelo s.t. 39 MENDES José Burgos-BH s.t. 40 BOHLI Tom BMC s.t. 41 STYBAR Zdenek Quick-Step Floors s.t. 42 DE GENDT Aimé Sport Vlaanderen-Baloise s.t. 43 RUBIO Diego Burgos-BH s.t. 44 FERRARI Fabricio Caja Rural-Seguros RGA s.t. 45 BROŻYNA Piotr CCC Sprandi Polkowice s.t. 47 MASSON Christophe WB-Aqua Protect-Veranclassic s.t. 49 ROCHE Nicolas BMC s.t. 50 FINETTO Mauro Delko-Marseille Provence s.t. 51 DECLERCQ Tim Quick-Step Floors s.t. 52 FABBRO Matteo Katusha-Alpecin s.t. 53 PARDILLA Sergio Caja Rural-Seguros RGA s.t. 54 CIEŚLIK Paweł CCC Sprandi Polkowice s.t. 55 GRMAY Tsgabu Trek-Segafredo s.t. 56 ORJUELA Fernando Manzana Postobon s.t. 57 FRANKINY Kilian BMC s.t. 58 KNOX James Quick-Step Floors s.t. 59 BOOKWALTER Brent BMC s.t. 60 WYSS Danilo BMC s.t. 61 ZABALA Josu Caja Rural-Seguros RGA s.t. 62 CABEDO Óscar Burgos-BH s.t. 63 VAN GOMPEL Mathias Sport Vlaanderen-Baloise s.t. 64 CONTI Valerio UAE-Team Emirates s.t. 65 SILVA Joaquim Caja Rural-Seguros RGA s.t. 66 BERNAS Paweł CCC Sprandi Polkowice s.t. 67 REIJNEN Kiel Trek-Segafredo s.t. 68 TEN DAM Laurens Team Sunweb s.t. 69 MORENO Javier Delko-Marseille Provence s.t. 70 NOVAK Domen Bahrain-Merida s.t. 71 POSTLBERGER Lukas Bora-hansgrohe s.t. 72 BODNAR Maciej Bora-hansgrohe s.t. 73 BOLE Grega Bahrain-Merida s.t. 74 FOMINYKH Daniil Astana s.t. 75 HAUSSLER Heinrich Bahrain-Merida s.t. 76 DUARTE Fabio Manzana Postobon s.t. 77 MOSER Moreno Astana s.t. 78 DE KORT Koen Trek-Segafredo s.t. 82 KEISSE Iljo Quick-Step Floors s.t. 83 THEUNS Edward Team Sunweb s.t. 84 MITRI James Burgos-BH s.t. 85 SAJNOK Szymon CCC Sprandi Polkowice s.t. 86 GIDICH Yevgeniy Astana s.t. 87 HODEG Álvaro José Quick-Step Floors s.t. 88 FROHLINGER Johannes Team Sunweb s.t. 89 BOL Jetse Burgos-BH s.t. 90 KOZONTCHUK Dmitry Gazprom-RusVelo s.t. 91 CONSONNI Simone UAE-Team Emirates s.t. 92 KURIANOV Stepan Gazprom-RusVelo s.t. 93 SAGAN Juraj Bora-hansgrohe s.t. 94 JULES Justin WB-Aqua Protect-Veranclassic s.t. 95 SIERRA Yecid Manzana Postobon s.t. 96 SESSLER Nícolas Burgos-BH s.t. 97 GRADEK Kamil CCC Sprandi Polkowice s.t. 98 RODRÍGUEZ Sergio Euskadi-Murias s.t. 101 JONES Brenton Delko-Marseille Provence s.t. 102 BERTAZZO Liam Wilier Triestina-Selle Italia s.t. 103 PORSEV Alexander Gazprom-RusVelo s.t. 105 BAKIRCI Nazim Turkish National Team s.t. 107 KIRSCH Alex WB-Aqua Protect-Veranclassic s.t. 108 BELKOV Maxim Katusha-Alpecin s.t. 114 PACIONI Luca Wilier Triestina-Selle Italia s.t. 115 VAN POPPEL Boy Trek-Segafredo s.t. 116 TLEUBAYEV Ruslan Astana s.t. 120 PER David Bahrain-Merida s.t. 121 ZAKHAROV Artyom Astana s.t. 122 COLEDAN Marco Wilier Triestina-Selle Italia s.t. 123 BYSTROM Sven Erik UAE-Team Emirates s.t. 124 WÜRTZ Mads Katusha-Alpecin s.t. 125 BARCELÓ Fernando Euskadi-Murias s.t. 126 NIEMIEC Przemysław UAE-Team Emirates s.t. 127 ZHUPA Eugert Wilier Triestina-Selle Italia s.t. 128 SAMLI Ferit Turkish National Team s.t. 129 AKDILEK Ahmet Turkish National Team s.t. 130 TXOPERENA Beñat Euskadi-Murias s.t. 131 BARRENETXEA Ander Euskadi-Murias s.t. 132 BEVILACQUA Simone Wilier Triestina-Selle Italia s.t. 133 PELUCCHI Matteo Bora-hansgrohe s.t. 134 ROSA Massimo Wilier Triestina-Selle Italia s.t. 135 STASSEN Julien WB-Aqua Protect-Veranclassic s.t. 136 MCCARTHY Jay Bora-hansgrohe s.t. 4 DRUCKER Jempy BMC s.t. 9 HAAS Nathan Katusha-Alpecin s.t. 10 LUTSENKO Alexey Astana s.t. 11 PRADES Eduard Euskadi-Murias s.t. 12 ANTUNES Amaro CCC Sprandi Polkowice s.t. 15 ULISSI Diego UAE-Team Emirates s.t. 16 ORKEN Ahmet Turkish National Team s.t. 17 BOHLI Tom BMC s.t. 18 DELTOMBE Kevin Sport Vlaanderen-Baloise s.t. 19 HOLLENSTEIN Reto Katusha-Alpecin s.t. 20 PEYSKENS Dimitri WB-Aqua Protect-Veranclassic s.t. 21 FERNÁNDEZ Delio Delko-Marseille Provence s.t. 22 GUERREIRO Ruben Trek-Segafredo s.t. 23 ARNDT Nikias Team Sunweb s.t. 24 TEUNISSEN Mike Team Sunweb s.t. 25 REIS Rafael Caja Rural-Seguros RGA s.t. 26 BEVIN Patrick BMC s.t. 27 FELLINE Fabio Trek-Segafredo s.t. 28 CRAS Steff Katusha-Alpecin s.t. 29 KASPERKIEWICZ Przemysław Delko-Marseille Provence s.t. 30 GARCÍA Jhojan Manzana Postobon s.t. 31 VERVAEKE Louis Team Sunweb s.t. 32 MASSON Christophe WB-Aqua Protect-Veranclassic s.t. 33 FINETTO Mauro Delko-Marseille Provence s.t. 34 ĐURASEK Kristijan UAE-Team Emirates s.t. 35 VILELA Ricardo Manzana Postobon s.t. 36 LIETAER Eliot WB-Aqua Protect-Veranclassic s.t. 37 CIEŚLIK Paweł CCC Sprandi Polkowice s.t. 39 ROVNY Ivan Gazprom-RusVelo s.t. 40 FABBRO Matteo Katusha-Alpecin s.t. 41 POSTLBERGER Lukas Bora-hansgrohe s.t. 42 ROCHE Nicolas BMC s.t. 43 MENDES José Burgos-BH s.t. 45 REIJNEN Kiel Trek-Segafredo s.t. 46 AGUIRRE Hernán Manzana Postobon s.t. 47 ARISTI Mikel Euskadi-Murias s.t. 48 DE KORT Koen Trek-Segafredo s.t. 49 HAUSSLER Heinrich Bahrain-Merida s.t. 50 DECLERCQ Tim Quick-Step Floors s.t. 51 WYSS Danilo BMC s.t. 52 STYBAR Zdenek Quick-Step Floors s.t. 53 DE GENDT Aimé Sport Vlaanderen-Baloise s.t. 54 BOLE Grega Bahrain-Merida s.t. 55 BROŻYNA Piotr CCC Sprandi Polkowice s.t. 56 PARDILLA Sergio Caja Rural-Seguros RGA s.t. 57 CABEDO Óscar Burgos-BH s.t. 58 VAN GOMPEL Mathias Sport Vlaanderen-Baloise s.t. 59 PADUN Mark Bahrain-Merida s.t. 60 BODNAR Maciej Bora-hansgrohe s.t. 61 FOMINYKH Daniil Astana s.t. 62 FRANKINY Kilian BMC s.t. 63 BOOKWALTER Brent BMC s.t. 64 GRMAY Tsgabu Trek-Segafredo s.t. 66 KNOX James Quick-Step Floors s.t. 67 NOVAK Domen Bahrain-Merida s.t. 68 CONTI Valerio UAE-Team Emirates s.t. 69 DUARTE Fabio Manzana Postobon s.t. 70 SILVA Joaquim Caja Rural-Seguros RGA s.t. 71 TEN DAM Laurens Team Sunweb s.t. 72 MORENO Javier Delko-Marseille Provence s.t. 76 SAJNOK Szymon CCC Sprandi Polkowice s.t. 77 JULES Justin WB-Aqua Protect-Veranclassic s.t. 78 GIDICH Yevgeniy Astana s.t. 79 BOL Jetse Burgos-BH s.t. 80 FROHLINGER Johannes Team Sunweb s.t. 81 MITRI James Burgos-BH s.t. 85 MOSER Moreno Astana s.t. 87 KEISSE Iljo Quick-Step Floors s.t. 89 PORSEV Alexander Gazprom-RusVelo s.t. 90 JONES Brenton Delko-Marseille Provence s.t. 94 KOZONTCHUK Dmitry Gazprom-RusVelo s.t. 95 SESSLER Nícolas Burgos-BH s.t. 99 GRADEK Kamil CCC Sprandi Polkowice s.t. 111 TLEUBAYEV Ruslan Astana s.t. 112 MORTIER Julien WB-Aqua Protect-Veranclassic s.t. 114 RODRÍGUEZ Sergio Euskadi-Murias s.t. 120 ZAKHAROV Artyom Astana s.t. 123 NIEMIEC Przemysław UAE-Team Emirates s.t. 129 BEVILACQUA Simone Wilier Triestina-Selle Italia s.t. 130 STASSEN Julien WB-Aqua Protect-Veranclassic s.t. Sam Bennet (green jersey) takes the stage win and becomes the GC leader. 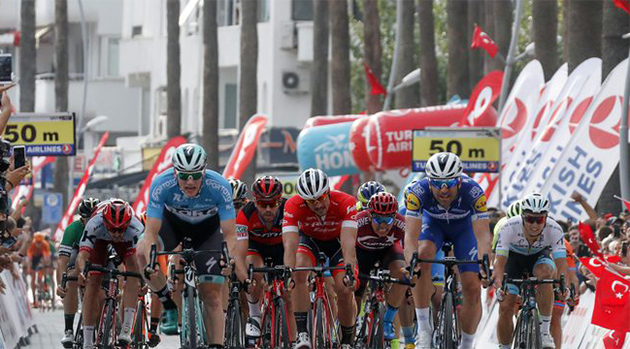 The second stage covered 155 flat kilometres from Alanya to Antalya, where BORA – hansgrohe Sam Bennett sprinted to glory. Like yesterday, a group of four riders went up the road and opened up a gap of some minutes, while BORA – hansgrohe took control over the peloton and closed the gap shortly before the finish. Approaching the finale, the BORA – hansgrohe train started to form their lead-out for Sam Bennett. After another great performance from the whole German team, the Irish sprinter took an impressive win ahead of A.J. Hodeg. Following his win, the BORA – hansgrohe sprinter now leads the sprint as well as the general classification of the Tour of Turkey. 2 HODEG Alvaro Quick-Step Floors s.t. 3 CONSONNI Simone UAE-Team Emirates s.t. 5 GARCÍA Ivan Bahrain-Merida s.t. 7 DEGENKOLB John Trek-Segafredo s.t. 8 SANZ Enrique Euskadi-Murias s.t. 9 PACIONI Luca Wilier Triestina-Selle Italia s.t. 10 PORSEV Alexander Gazprom-RusVelo s.t. 12 JULES Justin WB-Aqua Protect-Veranclassic s.t. 13 NOPPE Christophe Sport Vlaanderen-Baloise s.t. 14 GIDICH Yevgeniy Astana s.t. 15 BOHLI Tom BMC s.t. 16 SERRANO Gonzalo Caja Rural-Seguros RGA s.t. 17 SAJNOK Szymon CCC Sprandi Polkowice s.t. 18 REYES Aldemar Manzana Postobon s.t. 19 ANTUNES Amaro CCC Sprandi Polkowice s.t. 20 LUTSENKO Alexey Astana s.t. 21 PRADES Eduard Euskadi-Murias s.t. 22 DELTOMBE Kevin Sport Vlaanderen-Baloise s.t. 23 ULISSI Diego UAE-Team Emirates s.t. 24 FERNANDEZ Delio Delko-Marseille Provence s.t. 26 ÖRKEN Ahmet Turkish National Team s.t. 27 MORTIER Julien WB-Aqua Protect-Veranclassic s.t. 28 IRISARRI Jon Caja Rural-Seguros RGA s.t. 29 TEUNISSEN Mike Team Sunweb s.t. 30 HAAS Nathan Katusha-Alpecin s.t. 31 MASSON Christophe WB-Aqua Protect-Veranclassic s.t. 32 TRARIEUX Julien Delko-Marseille Provence s.t. 34 RICHEZE Maximiliano Quick-Step Floors s.t. 35 PEYSKENS Dimitri WB-Aqua Protect-Veranclassic s.t. 36 HOLLENSTEIN Reto Katusha-Alpecin s.t. 37 KURIANOV Stepan Gazprom-RusVelo s.t. 38 RUBIO Diego Burgos-BH s.t. 39 CRAS Steff Katusha-Alpecin s.t. 40 CIEŚLIK Paweł CCC Sprandi Polkowice s.t. 41 TLEUBAYEV Ruslan Astana s.t. 42 SHILOV Sergey Gazprom-RusVelo s.t. 43 ROVNY Ivan Gazprom-RusVelo s.t. 44 ARNDT Nikias Team Sunweb s.t. 45 FERRARI Fabricio Caja Rural-Seguros RGA s.t. 46 DE KORT Koen Trek-Segafredo s.t. 47 GUERREIRO Ruben Trek-Segafredo s.t. 48 VERVAEKE Louis Team Sunweb s.t. 49 VILELA Ricardo Manzana Postobon s.t. 50 LIETAER Eliot WB-Aqua Protect-Veranclassic s.t. 51 FRÖHLINGER Johannes Team Sunweb s.t. 52 CUBERO Jorge Burgos-BH s.t. 53 REIJNEN Kiel Trek-Segafredo s.t. 54 FABBRO Matteo Katusha-Alpecin s.t. 55 BEVIN Patrick BMC s.t. 56 NAVARDAUSKAS Ramūnas Bahrain-Merida s.t. 57 ZAKHAROV Artyom Astana s.t. 58 FELLINE Fabio Trek-Segafredo s.t. 59 ĐURASEK Kristijan UAE-Team Emirates s.t. 60 BOL Jetse Burgos-BH s.t. 61 CABEDO Óscar Burgos-BH s.t. 62 MENDES José Burgos-BH s.t. 63 TXOPERENA Beñat Euskadi-Murias s.t. 64 BOEV Igor Gazprom-RusVelo s.t. 65 PÖSTLBERGER Lukas Bora-hansgrohe s.t. 66 FOMINYKH Daniil Astana s.t. 67 STYBAR Zdenek Quick-Step Floors s.t. 68 ROCHE Nicolas BMC s.t. 69 BODNAR Maciej Bora-hansgrohe s.t. 70 BERTAZZO Liam Wilier Triestina-Selle Italia s.t. 71 PARDILLA Sergio Caja Rural-Seguros RGA s.t. 72 SAYAR Mustafa Turkish National Team s.t. 73 VAN GOMPEL Mathias Sport Vlaanderen-Baloise s.t. 74 WÜRTZ Mads Katusha-Alpecin s.t. 75 MITRI James Burgos-BH s.t. 76 VAN POPPEL Boy Trek-Segafredo s.t. 77 AGUIRRE HernAn Manzana Postobon s.t. 78 PER David Bahrain-Merida s.t. 79 KASPERKIEWICZ Przemysław Delko-Marseille Provence s.t. 80 WYSS Danilo BMC s.t. 81 BOLE Grega Bahrain-Merida s.t. 82 PADUN Mark Bahrain-Merida s.t. 83 BAKIRCI Nazim Turkish National Team s.t. 84 SIERRA Yecid Manzana Postobon s.t. 85 JONES Brenton Delko-Marseille Provence s.t. 86 AKDILEK Ahmet Turkish National Team s.t. 87 GARCÍA Jhojan Manzana Postobon s.t. 88 BARCELÓ Fernando Euskadi-Murias s.t. 89 FRANKINY Kilian BMC s.t. 90 BROŻYNA Piotr CCC Sprandi Polkowice s.t. 91 NOVAK Domen Bahrain-Merida s.t. 92 ARISTI Mikel Euskadi-Murias s.t. 93 KNOX James Quick-Step Floors s.t. 94 HAUSSLER Heinrich Bahrain-Merida s.t. 95 DE GENDT Aimé Sport Vlaanderen-Baloise s.t. 96 CONTI Valerio UAE-Team Emirates s.t. 97 GRMAY Tsgabu Trek-Segafredo s.t. 98 VAN HECKE Preben Sport Vlaanderen-Baloise s.t. 99 DUARTE Fabio Manzana Postobon s.t. 100 BOOKWALTER Brent BMC s.t. 101 DECLERCQ Tim Quick-Step Floors s.t. 102 NIEMIEC Przemysław UAE-Team Emirates s.t. 103 ZHUPA Eugert Wilier Triestina-Selle Italia s.t. 104 SPRENGERS Thomas Sport Vlaanderen-Baloise s.t. 105 ZABALA Josu Caja Rural-Seguros RGA s.t. 106 BEVILACQUA Simone Wilier Triestina-Selle Italia s.t. 108 COLEDAN Marco Wilier Triestina-Selle Italia s.t. 109 SILVA Joaquim Caja Rural-Seguros RGA s.t. 110 POZZATO Filippo Wilier Triestina-Selle Italia s.t. 111 TEN DAM Laurens Team Sunweb s.t. 112 MORENO Javier Delko-Marseille Provence s.t. 113 KOZONTCHUK Dmitry Gazprom-RusVelo s.t. 114 ATALAY Muhammed Turkish National Team s.t. 115 PELUCCHI Matteo Bora-hansgrohe s.t. 116 SESSLER Nícolas Burgos-BH s.t. 117 ORJUELA Fernando Manzana Postobon s.t. 119 TRUSOV Nikolay Gazprom-RusVelo s.t. 120 SAMLI Ferit Turkish National Team s.t. 121 BALKAN Onur Turkish National Team s.t. 122 STASSEN Julien WB-Aqua Protect-Veranclassic s.t. 123 MOSER Moreno Astana s.t. 124 ROSA Massimo Wilier Triestina-Selle Italia s.t. 125 BELKOV Maxim Katusha-Alpecin s.t. 127 BARRENETXEA Ander Euskadi-Murias s.t. 129 MIHAYLOV Nikolay Delko-Marseille Provence s.t. 131 SAGAN Juraj Bora-hansgrohe s.t. 135 PALUTA Michał CCC Sprandi Polkowice s.t. 4 CONSONNI Simone UAE-Team Emirates s.t. 6 SPRENGERS Thomas Sport Vlaanderen-Baloise s.t. 9 ORJUELA Fernando Manzana Postobon s.t. 11 SANZ Enrique Euskadi-Murias s.t. 12 PACIONI Luca Wilier Triestina-Selle Italia s.t. 14 GARCÍA Ivan Bahrain-Merida s.t. 15 PORSEV Alexander Gazprom-RusVelo s.t. 16 JULES Justin WB-Aqua Protect-Veranclassic s.t. 18 DEGENKOLB John Trek-Segafredo s.t. 19 BOHLI Tom BMC s.t. 20 ANTUNES Amaro CCC Sprandi Polkowice s.t. 22 HAAS Nathan Katusha-Alpecin s.t. 24 TRARIEUX Julien Delko-Marseille Provence s.t. 25 SERRANO Gonzalo Caja Rural-Seguros RGA s.t. 26 LUTSENKO Alexey Astana s.t. 27 GIDICH Yevgeniy Astana s.t. 29 DELTOMBE Kevin Sport Vlaanderen-Baloise s.t. 30 FERNANDEZ Delio Delko-Marseille Provence s.t. 31 TEUNISSEN Mike Team Sunweb s.t. 32 ÖRKEN Ahmet Turkish National Team s.t. 33 NAVARDAUSKAS Ramūnas Bahrain-Merida s.t. 35 TLEUBAYEV Ruslan Astana s.t. 36 REIS Rafael Caja Rural-Seguros RGA s.t. 37 GUERREIRO Ruben Trek-Segafredo s.t. 38 MORTIER Julien WB-Aqua Protect-Veranclassic s.t. 39 BOL Jetse Burgos-BH s.t. 40 REYES Aldemar Manzana Postobon s.t. 41 CRAS Steff Katusha-Alpecin s.t. 42 FELLINE Fabio Trek-Segafredo s.t. 43 ARNDT Nikias Team Sunweb s.t. 44 FINETTO Mauro Delko-Marseille Provence s.t. 45 MASSON Christophe WB-Aqua Protect-Veranclassic s.t. 46 CIEŚLIK Paweł CCC Sprandi Polkowice s.t. 47 JONES Brenton Delko-Marseille Provence s.t. 48 PÖSTLBERGER Lukas Bora-hansgrohe s.t. 49 BEVIN Patrick BMC s.t. 50 FABBRO Matteo Katusha-Alpecin s.t. 51 ROVNY Ivan Gazprom-RusVelo s.t. 52 GARCÍA Jhojan Manzana Postobon s.t. 53 VILELA Ricardo Manzana Postobon s.t. 54 SHILOV Sergey Gazprom-RusVelo s.t. 55 REIJNEN Kiel Trek-Segafredo s.t. 56 ĐURASEK Kristijan UAE-Team Emirates s.t. 57 VERVAEKE Louis Team Sunweb s.t. 58 DE KORT Koen Trek-Segafredo s.t. 59 BOEV Igor Gazprom-RusVelo s.t. 60 KASPERKIEWICZ Przemysław Delko-Marseille Provence s.t. 61 ROCHE Nicolas BMC s.t. 62 HAUSSLER Heinrich Bahrain-Merida s.t. 63 CUBERO Jorge Burgos-BH s.t. 64 FERRARI Fabricio Caja Rural-Seguros RGA s.t. 65 MENDES José Burgos-BH s.t. 66 BOLE Grega Bahrain-Merida s.t. 67 FRÖHLINGER Johannes Team Sunweb s.t. 68 LIETAER Eliot WB-Aqua Protect-Veranclassic s.t. 69 WYSS Danilo BMC s.t. 70 BODNAR Maciej Bora-hansgrohe s.t. 71 DECLERCQ Tim Quick-Step Floors s.t. 72 FOMINYKH Daniil Astana s.t. 73 VAN POPPEL Boy Trek-Segafredo s.t. 74 ZAKHAROV Artyom Astana s.t. 75 CABEDO Óscar Burgos-BH s.t. 76 VAN GOMPEL Mathias Sport Vlaanderen-Baloise s.t. 78 PARDILLA Sergio Caja Rural-Seguros RGA s.t. 79 STYBAR Zdenek Quick-Step Floors s.t. 80 DE GENDT Aimé Sport Vlaanderen-Baloise s.t. 81 BROŻYNA Piotr CCC Sprandi Polkowice s.t. 82 BOOKWALTER Brent BMC s.t. 83 MITRI James Burgos-BH s.t. 84 FRANKINY Kilian BMC s.t. 85 PADUN Mark Bahrain-Merida s.t. 86 GRMAY Tsgabu Trek-Segafredo s.t. 87 ARISTI Mikel Euskadi-Murias s.t. 90 SAYAR Mustafa Turkish National Team s.t. 91 BAKIRCI Nazim Turkish National Team s.t. 92 KNOX James Quick-Step Floors s.t. 93 NOVAK Domen Bahrain-Merida s.t. 94 DUARTE Fabio Manzana Postobon s.t. 95 AKDILEK Ahmet Turkish National Team s.t. 96 NIEMIEC Przemysław UAE-Team Emirates s.t. 97 CONTI Valerio UAE-Team Emirates s.t. 98 SILVA Joaquim Caja Rural-Seguros RGA s.t. 99 MORENO Javier Delko-Marseille Provence s.t. 100 TEN DAM Laurens Team Sunweb s.t. 101 KEISSE Iljo Quick-Step Floors s.t. 105 KOZONTCHUK Dmitry Gazprom-RusVelo s.t. 106 ATALAY Muhammed Turkish National Team s.t. 107 SESSLER Nícolas Burgos-BH s.t. 110 BARCELÓ Fernando Euskadi-Murias s.t. 111 VAN HECKE Preben Sport Vlaanderen-Baloise s.t. 115 POZZATO Filippo Wilier Triestina-Selle Italia s.t. 117 ZHUPA Eugert Wilier Triestina-Selle Italia s.t. 119 BEVILACQUA Simone Wilier Triestina-Selle Italia s.t. 120 KIRSCH Alex WB-Aqua Protect-Veranclassic s.t. 122 MOSER Moreno Astana s.t. 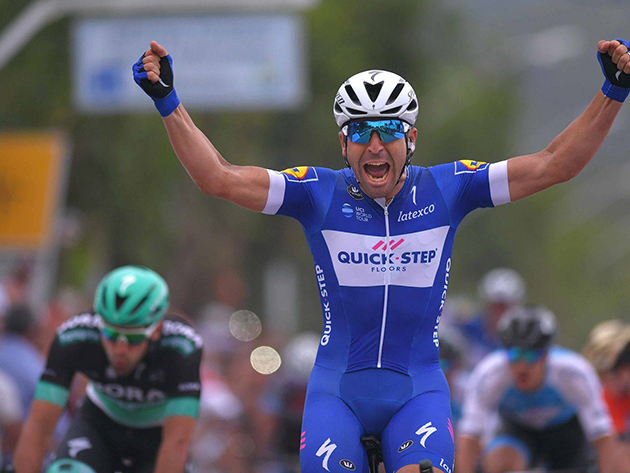 The race: Here's the report from winner Maximiliano Richeze's Quick-Step team. Ten years from his first victory at the Tour of Turkey, Maximiliano Richeze crossed the finish line arms aloft again at the Eurasian race, after one of the most confusing and hectic finales in the history of the event, at least since it has been upgraded in the UCI calendar. Starting and finishing in Konya, a city renowned in the Renaissance for its beautiful carpets exported in Europe, but famous now for the millions of tulips – the holy flower of the late Ottoman Empire – that deck its streets every spring, stage 1 of the Tour of Turkey took on a hilly course, containing several climbs, but that didn't stop Quick-Step Floors from controlling the break. Five men attacked early on the 148.4km-long stage, putting three minutes between them and the peloton headed by Tim Declercq, Iljo Keisse and Zdenek Stybar, who did a fine job in keeping the gap in check and reducing it to a mere minute by the time they crested the last classified ascent of the day, with 40 kilometers remaining. On the long downhill to Konya, "El Tractor" reeled in the quintet and made sure of bringing back to heel a late attack of Diego Rubio (Burgos-BH). Unfortunately, with less than four kilometers to go, Fernando Gaviria hit the deck and despite remounting, he didn't have any chance of rejoining the charging pack, as he was nursing his right shoulder. Quick-Step Floors immediately regrouped around neo-pro Alvaro Hodeg, winner of four races so far this season, only for the plan to change again, this time 600 meters from the line, when the Colombian was forced to brake after slipping on the crosswalk paint as he rounded a right-side bend. As the others hesitated, Richeze seized the moment and powered clear of the pack, opening a 30-meter gap on the peloton and carrying this advantage all the way to the line, where he had plenty of time left to celebrate his second victory of the season, after the one he took on home turf, at Vuelta a San Juan. It was Quick-Step Floors' 70th UCI success of this outstanding year and one that propelled Max at the top of the general and points classification at the Tour of Turkey. Max, who captured the 27th pro victory of his career, took us through the chaotic finale of the opening stage: "The plan was to go for the sprint with Fernando, but unfortunately he crashed and we had to quickly change our tactics so Alvaro would be the last man of our sprint train. In the last corner, Alvaro lost my wheel as he had to straighten his line in order not to crash, which meant I took a gap of 30 meters and went with all I had without looking back." Gaviria, for whom Richeze was supposed to do the lead-out, arrived at the finish after completing the last four kilometers of the stage, and was immediately taken to the local hospital where an X-ray revealed a clavicle fracture. On Wednesday, the 24-year-old Colombian will fly to Belgium where he will undergo further examination at the AZ Herentals Hospital, which will determine if an operation is required, but what's certain at this point is that he is forced to call it a season a few days earlier than planned. "I am very happy for this victory, it's my last race of the season and on World Tour level, so it means a lot to me, but it's a real pity Fernando crashed and broke his collarbone. I know how disappointed he is to end his season like that and I wish him to heal fast", Max continued. "I came here to work for Fernando, and if not him, Alvaro, so this win comes as a nice surprise. There will be other sprint opportunities this week and with Alvaro being the fastest on the team now, I will be there to help him." 2 BENNETT Sam Bora-hansgrohe s.t. 4 HODEG Álvaro Quick-Step Floors s.t. 5 JONES Brenton Delko-Marseille Provence s.t. 6 CONSONNI Simone UAE-Team Emirates s.t. 7 SANZ Enrique Euskadi-Murias s.t. 8 NOPPE Christophe Sport Vlaanderen-Baloise s.t. 9 THEUNS Edward Team Sunweb s.t. 10 PACIONI Luca Wilier Triestina-Selle Italia s.t. 12 PORSEV Alexander Gazprom-RusVelo s.t. 13 NAVARDAUSKAS Ramūnas Bahrain-Merida s.t. 14 SAJNOK Szymon CCC Sprandi Polkowice s.t. 16 TRARIEUX Julien Delko-Marseille Provence s.t. 17 GARCIA Iván Bahrain-Merida s.t. 18 GARCÍA Jhojan Manzana Postobon s.t. 20 PRADES Eduard Euskadi-Murias s.t. 21 ANTUNES Amaro CCC Sprandi Polkowice s.t. 22 ULISSI Diego UAE-Team Emirates s.t. 23 BOL Jetse Burgos-BH s.t. 24 HAUSSLER Heinrich Bahrain-Merida s.t. 25 HOLLENSTEIN Reto Katusha-Alpecin s.t. 26 DEGENKOLB John Trek-Segafredo s.t. 27 PÖSTLBERGER Lukas Bora-hansgrohe s.t. 29 LUTSENKO Alexey Astana s.t. 30 SPRENGERS Thomas Sport Vlaanderen-Baloise s.t. 31 GUERREIRO Ruben Trek-Segafredo s.t. 32 TLEUBAYEV Ruslan Astana s.t. 33 SERRANO Gonzalo Caja Rural-Seguros RGA s.t. 34 TEUNISSEN Mike Team Sunweb s.t. 35 KASPERKIEWICZ Przemysław Delko-Marseille Provence s.t. 36 GIDICH Yevgeniy Astana s.t. 37 PEYSKENS Dimitri WB-Aqua Protect-Veranclassic s.t. 38 FERNÁNDEZ Delio Delko-Marseille Provence s.t. 39 VAN ROOY Kenneth Sport Vlaanderen-Baloise s.t. 40 DELTOMBE Kevin Sport Vlaanderen-Baloise s.t. 41 ÖRKEN Ahmet Turkish National Team s.t. 42 DECLERCQ Tim Quick-Step Floors s.t. 44 BEVIN Patrick BMC s.t. 45 CRAS Steff Katusha-Alpecin s.t. 46 BOLE Grega Bahrain-Merida s.t. 47 ROCHE Nicolas BMC s.t. 48 FABBRO Matteo Katusha-Alpecin s.t. 49 BOEV Igor Gazprom-RusVelo s.t. 50 CIEŚLIK Paweł CCC Sprandi Polkowice s.t. 51 ĐURASEK Kristijan UAE-Team Emirates s.t. 52 REIS Rafael Caja Rural-Seguros RGA s.t. 53 TXOPERENA Beñat Euskadi-Murias s.t. 54 MORTIER Julien WB-Aqua Protect-Veranclassic s.t. 55 WYSS Danilo BMC s.t. 56 FINETTO Mauro Delko-Marseille Provence s.t. 57 REIJNEN Kiel Trek-Segafredo s.t. 58 VILELA Ricardo Manzana Postobon s.t. 59 MASSON Christophe WB-Aqua Protect-Veranclassic s.t. 60 ROVNY Ivan Gazprom-RusVelo s.t. 61 BOOKWALTER Brent BMC s.t. 62 DE GENDT Aimé Sport Vlaanderen-Baloise s.t. 63 ZABALA Josu Caja Rural-Seguros RGA s.t. 64 VERVAEKE Louis Team Sunweb s.t. 66 REYES Aldemar Manzana Postobon s.t. 67 DE KORT Koen Trek-Segafredo s.t. 69 VAN POPPEL Boy Trek-Segafredo s.t. 70 BROŻYNA Piotr CCC Sprandi Polkowice s.t. 71 CUBERO Jorge Burgos-BH s.t. 72 GRADEK Kamil CCC Sprandi Polkowice s.t. 73 BODNAR Maciej Bora-hansgrohe s.t. 74 FRANKINY Kilian BMC s.t. 75 AGUIRRE Hernán Manzana Postobon s.t. 77 ORJUELA Fernando Manzana Postobon s.t. 78 FOMINYKH Daniil Astana s.t. 79 GRMAY Tsgabu Trek-Segafredo s.t. 80 FRÖHLINGER Johannes Team Sunweb s.t. 81 FERRARI Fabricio Caja Rural-Seguros RGA s.t. 82 LIETAER Eliot WB-Aqua Protect-Veranclassic s.t. 83 PARDILLA Sergio Caja Rural-Seguros RGA s.t. 84 PADUN Mark Bahrain-Merida s.t. 85 PALUTA Michał CCC Sprandi Polkowice s.t. 86 CABEDO Óscar Burgos-BH s.t. 87 MITRI James Burgos-BH s.t. 88 ŠTYBAR Zdeněk Quick-Step Floors s.t. 89 ARISTI Mikel Euskadi-Murias s.t. 90 ZAKHAROV Artyom Astana s.t. 92 BAKIRCI Nazim Turkish National Team s.t. 93 SAYAR Mustafa Turkish National Team s.t. 94 KNOX James Quick-Step Floors s.t. 95 BIZHIGITOV Zhandos Astana s.t. 97 NOVAK Domen Bahrain-Merida s.t. 98 MORENO Javier Delko-Marseille Provence s.t. 99 LAENGEN Vegard UAE-Team Emirates s.t. 101 SILVA Joaquim Caja Rural-Seguros RGA s.t. 102 RODRÍGUEZ Sergio Euskadi-Murias s.t. 103 IRISARRI Jon Caja Rural-Seguros RGA s.t. 104 KEISSE Iljo Quick-Step Floors s.t. 105 AKDILEK Ahmet Turkish National Team s.t. 110 KURIANOV Stepan Gazprom-RusVelo s.t. 111 ATALAY Muhammed Turkish National Team s.t. 112 SESSLER Nícolas Burgos-BH s.t. 115 BARCELÓ Fernando Euskadi-Murias s.t. 116 VAN HECKE Preben Sport Vlaanderen-Baloise s.t. 122 BEVILACQUA Simone Wilier Triestina-Selle Italia s.t. 123 KIRSCH Alex WB-Aqua Protect-Veranclassic s.t. 124 STASSEN Julien WB-Aqua Protect-Veranclassic s.t. 125 MIHAYLOV Nikolay Delko-Marseille Provence s.t. 126 SAGAN Juraj Bora-hansgrohe s.t. 127 SARAMOTINS Aleksejs Bora-hansgrohe s.t. 128 BERTAZZO Liam Wilier Triestina-Selle Italia s.t. 131 BELKOV Maxim Katusha-Alpecin s.t. 132 BARRENETXEA Ander Euskadi-Murias s.t. 133 BYSTRØM Sven Erik UAE-Team Emirates s.t. 134 MCCARTHY Jay Bora-hansgrohe s.t. 7 CONSONNI Simone UAE-Team Emirates s.t. 9 NOPPE Christophe Sport Vlaanderen-Baloise s.t. 10 THEUNS Edward Team Sunweb s.t. 11 PACIONI Luca Wilier Triestina-Selle Italia s.t. 12 HAAS Nathan Katusha-Alpecin s.t. 13 PORSEV Alexander Gazprom-RusVelo s.t. 14 NAVARDAUSKAS Ramūnas Bahrain-Merida s.t. 15 SAJNOK Szymon CCC Sprandi Polkowice s.t. 17 TRARIEUX Julien Delko-Marseille Provence s.t. 18 GARCIA Iván Bahrain-Merida s.t. 20 BOHLI Tom BMC s.t. 22 ANTUNES Amaro CCC Sprandi Polkowice s.t. 24 BOL Jetse Burgos-BH s.t. 25 HAUSSLER Heinrich Bahrain-Merida s.t. 26 HOLLENSTEIN Reto Katusha-Alpecin s.t. 27 DEGENKOLB John Trek-Segafredo s.t. 28 PÖSTLBERGER Lukas Bora-hansgrohe s.t. 29 FELLINE Fabio Trek-Segafredo s.t. 30 LUTSENKO Alexey Astana s.t. 31 SPRENGERS Thomas Sport Vlaanderen-Baloise s.t. 32 GUERREIRO Ruben Trek-Segafredo s.t. 33 TLEUBAYEV Ruslan Astana s.t. 34 SERRANO Gonzalo Caja Rural-Seguros RGA s.t. 36 KASPERKIEWICZ Przemysław Delko-Marseille Provence s.t. 37 GIDICH Yevgeniy Astana s.t. 38 PEYSKENS Dimitri WB-Aqua Protect-Veranclassic s.t. 39 FERNÁNDEZ Delio Delko-Marseille Provence s.t. 53 MORTIER Julien WB-Aqua Protect-Veranclassic s.t. 54 WYSS Danilo BMC s.t. 55 FINETTO Mauro Delko-Marseille Provence s.t. 56 REIJNEN Kiel Trek-Segafredo s.t. 57 VILELA Ricardo Manzana Postobon s.t. 58 MASSON Christophe WB-Aqua Protect-Veranclassic s.t. 59 ROVNY Ivan Gazprom-RusVelo s.t. 60 BOOKWALTER Brent BMC s.t. 61 DE GENDT Aimé Sport Vlaanderen-Baloise s.t. 62 ZABALA Josu Caja Rural-Seguros RGA s.t. 63 VERVAEKE Louis Team Sunweb s.t. 64 MENDES José Burgos-BH s.t. 65 REYES Aldemar Manzana Postobon s.t. 66 DE KORT Koen Trek-Segafredo s.t. 67 SHILOV Sergey Gazprom-RusVelo s.t. 68 VAN POPPEL Boy Trek-Segafredo s.t. 69 BROŻYNA Piotr CCC Sprandi Polkowice s.t. 70 CUBERO Jorge Burgos-BH s.t. 71 GRADEK Kamil CCC Sprandi Polkowice s.t. 73 FRANKINY Kilian BMC s.t. 74 AGUIRRE Hernán Manzana Postobon s.t. 76 ORJUELA Fernando Manzana Postobon s.t. 77 FOMINYKH Daniil Astana s.t. 78 GRMAY Tsgabu Trek-Segafredo s.t. 79 FRÖHLINGER Johannes Team Sunweb s.t. 80 FERRARI Fabricio Caja Rural-Seguros RGA s.t. 81 LIETAER Eliot WB-Aqua Protect-Veranclassic s.t. 82 PARDILLA Sergio Caja Rural-Seguros RGA s.t. 83 PADUN Mark Bahrain-Merida s.t. 84 PALUTA Michał CCC Sprandi Polkowice s.t. 85 CABEDO Óscar Burgos-BH s.t. 86 MITRI James Burgos-BH s.t. 87 ŠTYBAR Zdeněk Quick-Step Floors s.t. 88 ARISTI Mikel Euskadi-Murias s.t. 89 ZAKHAROV Artyom Astana s.t.